Hoppers won 38-32 in the Midlands in December and will be looking to make up for the disappointment of narrowly losing their unbeaten six-match run in a gutsy performance at National League Two North leaders Hull Ionians last Saturday. Stourbridge, who have a game in hand of most of their rivals, arrive on the back of a surprisingly big home victory over Otley last week, when they ran in 60 points, but have won only twice on the road all season. Ryan Purcell and Matt Crow are ruled out through injury, so prop Dan Madden and threequarter Sam Stott step up from the bench for Hoppers. Winger Connor Trueman returns after injury to replace the unavailable Scott Jordan and there is a first appearance among the replacements for home-grown forward Harry Holden. 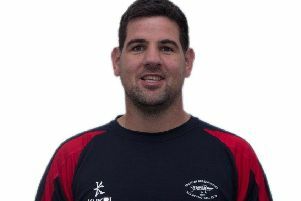 Head coach Paul Arnold (above) will hit a couple of milestones if he brings himself off the bench – 425 National League and Cup appearances and 450 when the North Premier League is included. With the addition of cup, county and representative games, “Arnie” has racked up well over 500 appearances. Nearer the top of the table, there is an interesting clash at Huddersfield, where Fylde are the visitors. The Lancashire side hold third place because of a better points differential and are seeking to avoid a third successive defeat. Huddersfield are 11 points behind the top two with three games left. Vale of Lune’s final away-day in the North Premier League takes them to seventh-placed Wirral, who won 13-12 at Powderhouse Lane in December. Already-relegated Vale have lost their last seven in a total of 19 defeats, three victories and two draws. Coach Dan Williams is leaving the club at the end of the campaign. With Jordan Dorrington a major injury doubt, Vale welcome back Billy Swarbrick at scrum-half, while Ross Pillow returns at prop. Hoppers: Spence; Trueman, Hurst, Fitzpatrick, Stott; T Davidson, Gough; Madden, Millea, Altham, Howard, Procter, Murray, Carlson, Lamprey. Replacements: Miller, Trippier, Holden, Arnold, W Davidson. Vale (from): Ramwell, Hall, Owens, B Dorrington, Fern, Robertson, Briggs, J Dorrington, Swarbrick; Stevens, Powers, Pillow, Preston, Foxcroft, Ford, Holdbrook, Ayrton, S Wallbank, J Wallbank.